Friday has finally arrived and is it just me, or did the world collectively sigh? This time of year is a little bit nuts. There's just so much to do on top of the normal routine! My 12 Manicures of Christmas series is now underway, so I'm just mixing in the Fishbowl Friday prompt like I did during the 31 Day Nail Art Challenge back in September. Fishbowl Friday 057 is brought to you by the DELICATE prompt. Oddly enough, this one gave me trouble the past two years during the 31 Day Challenge, but throw in a Holiday theme and I know just what to do! Did I mention that I re-organized my stash the other day? Peanut had a sleepover, so I embarked on the fun journey of switching all of my polish around. Previously, it was sorted by color. Now, it is sorted by brand, and I'm pretty sure it will stay that way. I definitely feel more organized. While I was moving things around, I came across my bottles of It's Real 18K Gold. One bottle is still in its box, proudly wearing the TJ Maxx sticker that reminds me how ah-mazing of a deal it was. The other, I've only used one time. I wish I could say that it was a singular sad case, but the truth is, there are so many untried polishes in my collection that it's not really funny. And also a lot of other ones that I've only used once. Since the Holidays are a time of glitter and sparkle, I pulled the bottle out and placed it on my nail desk to remind myself to use it. When the DELICATE prompt came along, I knew that I wanted to use It's Real 18K Gold, and figured out pretty quickly what I would layer it over. Back in October, I ordered the Pahlish Monthly Duo which included Autumn People and Stopped Watch. You've heard me talk about my affections for Autumn People, but it's time that I sang the praises of the other half of the Duo. 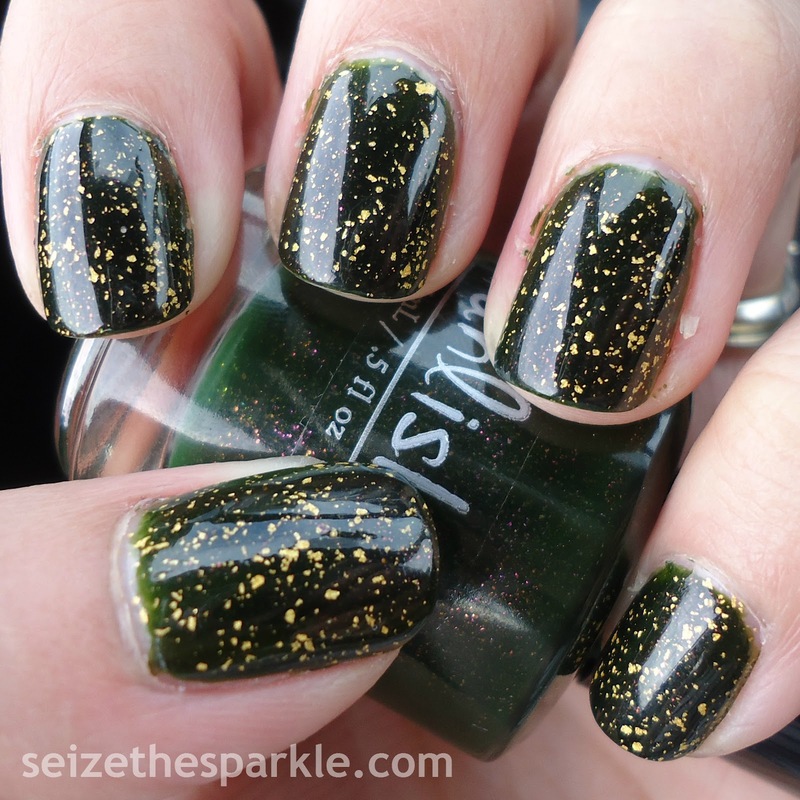 Stopped Watch is a gorgeous dark green jelly polish. 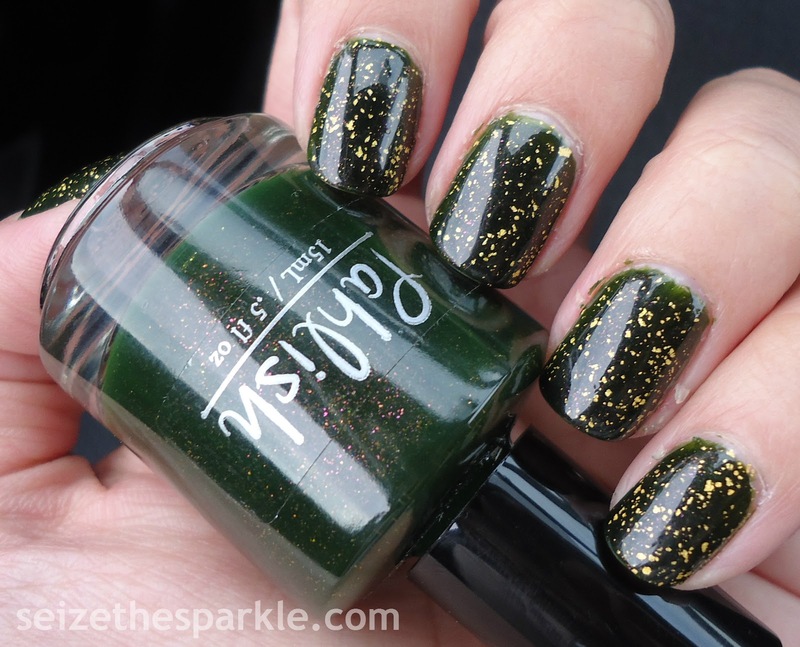 Now, when I first blogged about Stopped Watch, I said that "It's an almost-blackened olive jelly with super fine fuchsia, copper, and gold glitter running through it." And don't get me wrong, that's all still true. For the most part. I think I'd take out the almost blackened part, because Stopped Watch is definitely a polish that knows that it's green. It's not trying to be the color black. I don't know if I couldn't see it as clearly with Autumn People overtop of it? 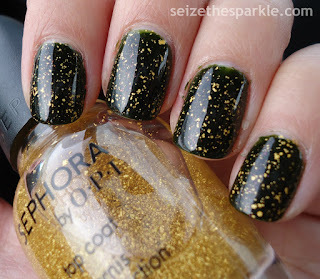 Wearing it with a more sparse glitter overtop of it has really made me appreciate the shade. There's no mistaking that it's green, and I love the way it looks in sunlight. Adding It's Real 18K Gold overtop? I'm seriouly in love! I remember being a little disappointed that the flakes in SOPI's version of this product weren't as big as some other brands. But I've come to appreciate the subtle way that they add shine to this manicure. Subtle and DELICATE, don't you think? We all talk about shopping our stashes more often, and I'm thinking that's something I really need to start actually doing. Not sure if it will be a series or just regular posts? If you've got any ideas, feel free to leave them in the comments! P.S. Just a little update... I only now realized that the actual prompt was ELEGANT, not DELICATE. Not sure how I managed to convince myself that's what it was, but let's just blame it on the eggnog, shall we?